An inexpensive replacement for your original remote key fob, the keyless2go car key replacement is self-programmable and comes with easy do-it-yourself instructions to help you program your new car key at home. Enjoy keyless entry on a wide variety of vehicles from ford, Lincoln, and mercury. Each fob key has been pre-tested to ensure compatibility and that signals are transmitting properly. Every remote key fob comes complete with batteries and free tech support to help get your new smart key working. 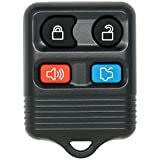 This keyless entry remote key fob is a replacement for part numbers 2l2t-15k601-ba, 2l3t-15k601-aa, 8s4z-15k601-aa, 2s4t-15k601-ab, 8s4t-15k601-aa, f8db-15k601-ba, f87b-15k601-ba, 2s4t-15k601-aa, 2l2z-15k601-ba, 1l2t-15k601-aa, 5925872 and FCC id: Cwtwb1u331, cwtwb1u345, cwtwb1u322, gq43vt11t.